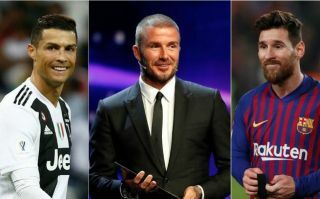 Manchester United and England legend David Beckham has responded to talk of potentially sealing the ambitious transfers of Cristiano Ronaldo or Lionel Messi for his club Inter Miami. The team is set to join the MLS in 2020 and there has unsurprisingly been plenty of speculation about the big names Beckham could try to bring in to get his franchise off the ground. With Ronaldo and Messi both in their 30s now, there could perhaps be a realistic chance of them both quitting European football for an easier life in the US or elsewhere, as is becoming increasingly common with football’s biggest names. Legendary figures of the last decade like Wayne Rooney and Zlatan Ibrahimovic are playing in the MLS at the moment, as of course did Beckham towards the end of his career. Still, the former Man Utd star does not sound like he wants to get his hopes up about signing Messi or Ronaldo as he responded to such talk, with quotes from Fox Sports.